The people responsible for implementing the unconditional and extremely invasive surveillance of all people on campus claim that this installation will enhance individual's privacy as it is necessary for improving campus security, and security is a requirement for privacy. lol. or cry. idk. Yes, security is a requirement for privacy, but analyzing and storing all data, including the most private information, is a particularly bad attempt to achieve the goal. First, it is only a matter of time until the skillful attackers break into the surveillance system and get all data served on a silver tray. Second, the main use-case would be to analyze attacks after they happened, not prevent them. Third, parts of the UC IT are quite outdated and presumably contain lots of security holes. Fixing them first would be much more effective. Fourth, giving a third party access to all private data is a bad idea because it greatly extends the set of trusted people, devices, and networks. Fifth, today they promise to only use the data for protecting the network. When we already store all this data the next generation will legitimately ask, why it is not used to resolve other crime cases as well. A few years later, the government just slightly changes how to define crime. 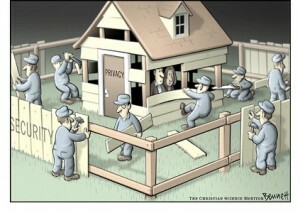 Again we see the security argument applied as a plain decoy to justify peoples nasty surveillance dreams. Or maybe they just don't know better? Idk. Btw: Berkeley is worldwide one of the top research institutions in Computer Security. Apparently non of the faculty or students were asked to assist with making the network more secure. Instead an external party was secretly contracted. This entry was posted in Uncategorized on February 2, 2016 by Tobias Boelter. 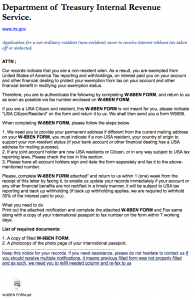 It tells me that because I am a non-resident alien in the US I need to submit additional information to the IRS because I opened a bank account and I am exempt from "tax withholdings on interest paid". All this was true to me and because I only very quickly skimmed the e-mail I did not detect any major flaws in the language. 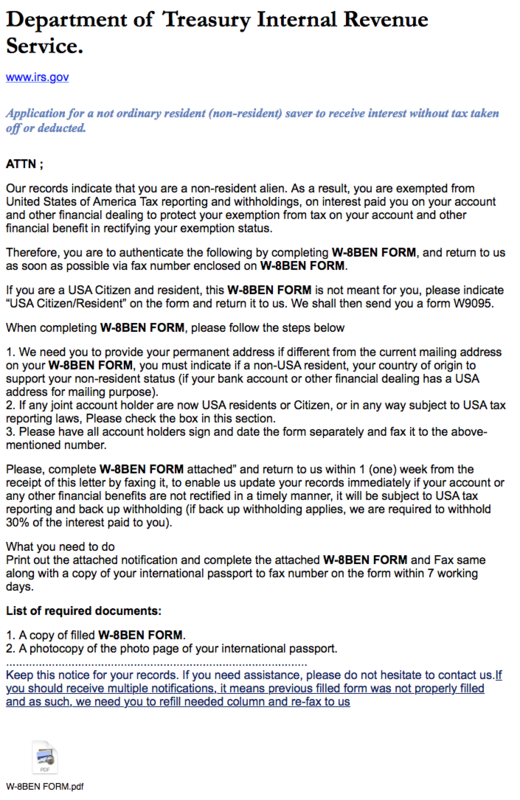 I would never expect a German authority to send me such an request by email but the Americans do many sensitive stuff online so I was not really surprised by the fact that "IRS" was communicating with me via email. I also gave them my email address on another form a few month ago. What finally helped me to identify that it was a phishing attempt was that a google search for the indicated Fax number did not give any results. I would have expected to find it on some IRS website. Then I looked at the mail headers which revealed that the sender address was spoofed and finally made it clear that this is indeed a phishing attempt. I am glad I realized this in the last minute as the information I would have provided on the form would be enough for an attacker to try to call my bank and reset the password with the information or something similar. I am wondering why the phishing email was so well targeted at me. Or is my view just biased because I directly delete all other phishing mails? By the way, the IRS never communicates by email. More information on their website. This entry was posted in Uncategorized on January 23, 2016 by Tobias Boelter. Today started the 2 month Summer Program on Cryptography at the Simons Institute in Berkeley. The Simons Institute for the Theory of Computing is an exciting new venue for collaborative research in theoretical computer science. The Institute typically hosts two concurrent programs per semester, where each is led by a small group of organizers who are recognized experts in their fields, and involves about 40-50 invited long-term participants (a mix of senior and junior researchers) who spend at least one month (usually longer) at the Institute. The Cryptography program started today with an one week bootcamp that is intended to bring every participant on the same page regarding the recent developments in crypto. This day was extremely instructive because the lectures were not only very up to date but also very well taught, as opposed to the standard conference talk. And what is really amazing is that the lectures were recorded and are now available online! So have a look at them! This entry was posted in Cryptography, Theoretical Computer Science on May 18, 2015 by Tobias Boelter. Yesterday I landed in Sofia, Bulgaria and today is the first day of EUROCRYPT, the first academic conference I attend and I am very excited! This entry was posted in Cryptography on April 27, 2015 by Tobias Boelter.